A burst of creativity is a common side-effect of summer. With so many hours in the day and a lack of things to do toward the end of the summer, it’s easy to feel antsy. Luckily, there is virtually an unlimited amount of crafts available to busy your hands. Even better, with the marvelous invention of Pinterest, you can sift through tons of creative projects to find the perfect one for you! 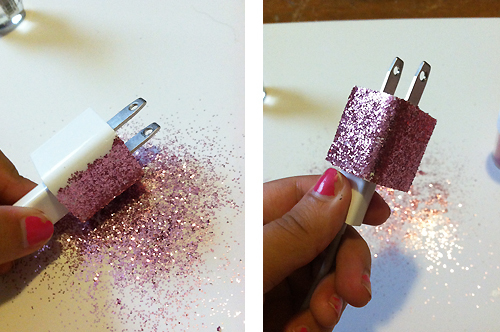 While searching for the perfect crafty creation, I stumbled upon a photo of someone who had DIY’d their iPhone charger with glitter! Of course, this prompted me to find others who had attempted this noble feat. I’ve been stocking up on dorm accessories lately— all of them pink, of course— so a glance at the pink-glittered charger was enough to sway me. Thus, with dreams of pink glitter floating around in my head, I set out for the craft store immediately. Here are all the steps and materials needed to DIY your perfect charger. First you’re going to paint the Mod Podge on the area you want glittered on the charger. Try and do one side at a time so you can let each layer of glitter dry after applying. Then, you’ll sprinkle some glitter on your work surface. 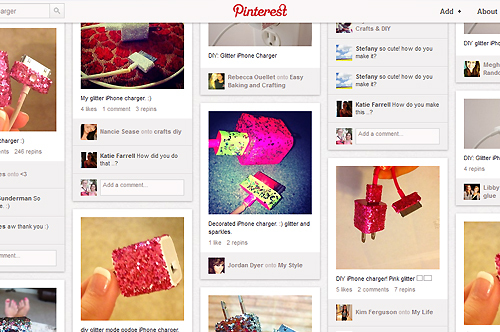 Press the side of the charger with Mod Podge applied on it down on the glitter, and presto! 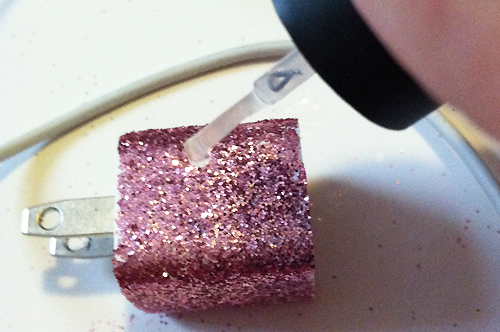 The sides of the charger are a bit harder to get at, so you may need to apply Mod Podge and sprinkle the glitter directly on the charger, dusting excess glitter off with your fingertip lightly. 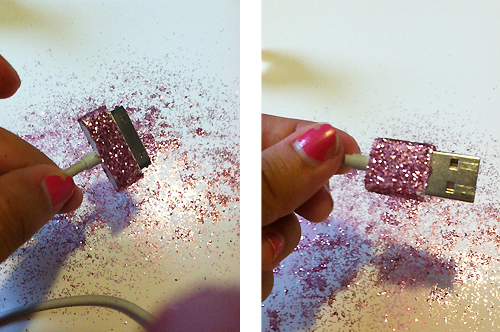 You can then apply glitter to the USB end and iPhone plug-in if you so desire, using the same technique as you did with the wall outlet block of the charger. Take caution! Try not to get glitter in the little nooks and crannies of the USB end, etc. You don’t want glitter getting stuck in your phone or computer port! 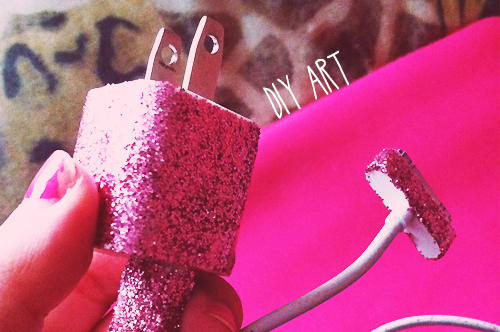 After you’ve applied glitter everywhere you want on your charger, use a clear nail polish to seal your work. Use a couple of layers to really secure it, letting each layer dry completely in between coats. 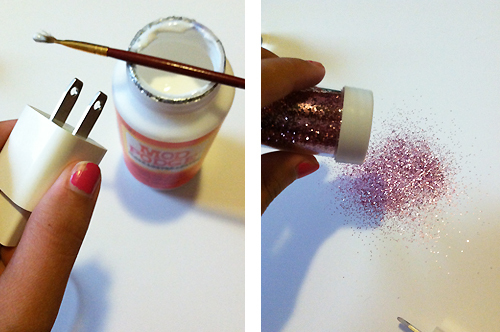 Once you’ve done this, your glittery creation should be good to go! Great job! 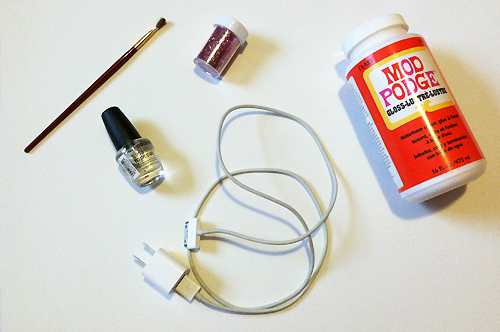 With that, you have everything you need to know about crafting the most fantastic DIY glitter iPhone charger. Your friends will be jealous, and it will look fabulous with one of your most precious assets— your iPhone! There are always tons of ways to exert some creative energy as well as make some really unique items… all you have to do is find a little inspiration! i taped the 2 metal sides of the charger so no mod podge or glitter could get in it and it definitly helped! you just have to take it off after it dries. then you dont have to scrape anything off of the metal parts. Could you use regular glue or does it have to be mod podge? does the glitter stay on very well?